We were super excited when we got tagged by Ellyn @ Allonsythornraxx in her original tag! We’ve loved reading everyone’s Behind the Blogger Book Tag so far, since it’s so much fun getting to know everyone better. We hope you enjoy our contribution as well! 1. WHY DID YOU START BLOGGING & WHY HAVE YOU KEPT BLOGGING? Chana: I started blogging after first going to BookCon. I had an amazing time, and it was just after that weekend that Malka introduced me to the world of bookstagrammers and book bloggers. I had no idea that any of it existed, but once I saw the community I definitely wanted to join in! Malka: I mentioned starting a book blog to Chana sort of as a joke at BookCon. I had been reading blogs for a while but never had the courage to start one on my own. 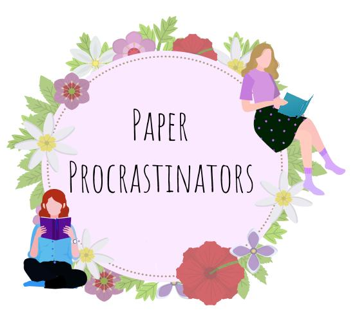 When Chana was super enthusiastic about the idea, we actually went for it, and a month later Paper Procrastinators was born! I’ve kept blogging because it’s fun to have discussions about bookish topics of every variety and to interact with all the other blogs out there. 2. WHAT IS YOUR FAVOURITE TYPE OF BLOG POST TO WRITE? Chana: I love writing discussions! Mostly because they’re a way for me to rant and rave as much as I want to. Malka: Totally agree with Chana here. Discussions are the best! I just have so much to say, and I love hearing that people feel the same way, or sometimes that they feel differently. But knowing that this is something that people have thought about or that I made them think about and want to chat with me about is a really great feeling. Plus writing discussions comes naturally to me, while I find that review takes a great deal of effort. 3. WHAT ARE YOUR TOP 3 FAVOURITE BLOG POSTS? Chana: I love our Debate Its. They’re such fun to write. I also really like making book lists. I’ve only written two or three book-list posts so far, but I enjoyed doing both of them. Malka: Oooh, the Debate Its for sure make this list. All of them, really. I’m also pretty proud of my discussion last month, about commenting on old posts. I’m also really happy with my review of You Asked for Perfect since I poured out my heart into expressing my love for that book. 4. WHAT ARE SOME OF YOUR FAVOURITE THINGS TO DO TO RELAX? Chana: I like reading (obviously), but I also love watching movies with my family. My family’s really into their movies, so it’s always fun to have a movie night so that we can all hang out. 5. WHAT ARE 3 OF YOUR FAVOURITE THINGS? Chana: I like brownies, classical music, and learning weird facts. Malka: Favorite Things from the Sound of Music is now running through my mind. If we’re excluding the obvious answer of books, I’d have to go with super soft and cozy sweaters, snickerdoodle ice cream, and snow falling. 6. WHAT ARE YOUR PROUDEST BLOGGING MOMENTS? Chana: When people comment on our discussions and say they liked them !!!!! It feels amazing! Malka: Chana has been stealing my answers. I think comments are amazing, but I also love when other bloggers like our posts enough to share them with their followers. We’re a super small blog, and the fact that people like our posts enough to share them always blows my mind. 7. WHAT ARE YOUR HOBBIES OUTSIDE OF BLOGGING? Chana: Now that I’m in school full time I don’t have much time for hobbies, but when I do I like playing violin and drawing. Malka: Honestly, all I’ve ever been known for is reading. I pretty much only talk about books and school if you ever meet me. This blog might make me seem exciting but I really only excel at books. In terms of interest though, I’m a huge science nerd and so I love learning random scientific facts. Chana: This is really hard, because there’s the way I see my personality and the way other people see my personality. Maybe I’ll just make Malka do this for me. Malka is kind, thoughtful, and energetic. Besides for being a great friend, one of her best qualities is her inborn urge to feed others. She always has food on her. Always. Malka: Awww, Chana’s answers were super sweet! And I’m more than happy to describe Chana’s personality. Chana is sarcastic, enthusiastic, and loyal. She’s an awesome friend and always manages to make me laugh. Chana: I don’t like when people confidently give over false information, I don’t like when people talk very loudly, and I don’t like it when people are walking suuuper slow but also taking up the whole sidewalk. Malka: Chana’s answers make me feel like I can’t beat that level of annoying. So one of my pet peeves is when Chana steals all my answers for tags. Another pet peeve is when people want you to be happy when you’re having a bad day. JUST LET ME MOPE. And my last pet peeve is when people don’t signal when they’re driving. How am I supposed to know if I can drive if you don’t tell me what you plan on doing?? Do you WANT to crash?? 10. WHAT’S SOMETHING YOUR FOLLOWERS DON’T KNOW ABOUT YOU? Chana: I can’t think of anything interesting so…. I have 4 siblings. 3 brothers and 1 sister. Malka: Let’s go for super random over here. I had braces 3 separate times. And now I wear my retainers every night in fear that I’ll have to get braces a 4th time if I don’t. Fear is a powerful motivator. Since we enjoy your interaction so much, we’re tagging some of the lovely people who either interact often with our blog, or have commented recently! We’d love for you to do this tag! What was something you learned about us in this post? Anything surprising in here? Let us know a favorite post of yours that we should check out! Cool tag. Discussions are my favorite posts, too. They’re less restrictive than other kinds of posts, so I can go nuts with them. Thanks! That’s exactly it! I like the freedom of being as creative as I want while writing! Ugh yes, people are obviously trying to get on our nerves. Getting in our way and not bending to our every whim, for shame! Loved your answers girls! I have no idea what snickerdoodle ice cream is but I’m glad it’s one of your favourite things, Malka! Also, Chana you’re spot on, people who walk slowly and take up all of the pavements are rude and need to LEAVE. Thanks so much for tagging us! I’m so glad I get to explain the wonders of snickerdoodle ice cream to you because of it. So snickerdoodle ice cream is this delicious cinnamon flavored ice cream, that contains pieces of snickerdoodle cookie dough in it. It’s one of my favorite comfort foods! Ahh, that sounds like so much fun, we don’t have anything that good in Aus! Wow, thank you so much for tagging me! I’m excited to answer these questions…that is, when I finally get back to blogging, because I’ve been SWAMPED lately! I also loooove writing discussion posts. It’s my favorite part of blogging – aside from reading and commenting on other people’s posts. I love getting to express my opinion. Half the time when I sit down to write a post, I end up coming up with something that I never even realized was something I thought or believed about the topic. We totally understand what it means to get swamped! We can’t wait to see your answers whenever you get around to this! And yes! There is so much I love about discussion posts, and breaking down how I feel about a topic is just one of my many reasons. It’s so interesting to see where the discussion takes you! I also find that if I write a post really far in advance, there are times when I need to make changes to my original post because my opinions have already changed or I have something new I want to add! It was nice learning more about you guys! And I definitely relate to all your pet peeves! People walking super slow whilst taking up the whole sidewalk is a massive pet hate of mine, but it gets a bit awkward if I’m with my sister because she’ll literally be tutting and walking right up behind them! And the not signalling is the worst, especially if you’re waiting to pull out of somewhere and you could have gone if they’d just told you where they were going! Can’t wait to see! This was a really fun way to share more about ourselves in a non-bookish fashion! It took me a few days to come up with pet peeves because of how much I agreed with Chana’s that I couldn’t think of something more annoying! But then I went for a drive and was inspired. I don’t understand why people don’t use indicators more! It’s not difficult, and it helps everyone drive better!